The following describe and illustrate a variety of necklines used in garments. These terms are often used in Ivy and Pearl Boutique apparel descriptions. 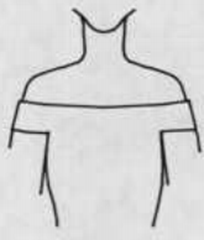 Note that some necklines may overlap with others or be considered a subset of another neckline. 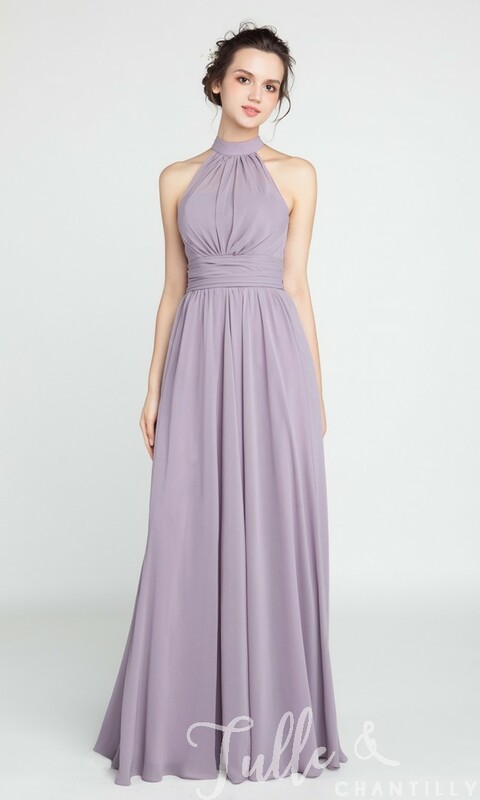 An asymmetrical neckline is one that looks different on either side. 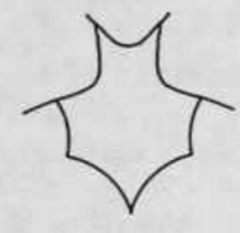 This could be because it is cut differently or because one side is folded down. 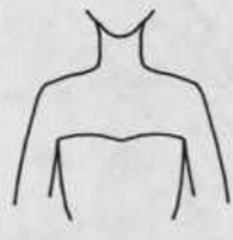 A banded neckline is a flat, shaped narrow band finish the neckline and front opening (shop banded necklines). 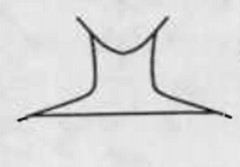 A front center portion of a garment, usual oval or square. It may be set into a blouse or dress below the neckline or extend upward from the waist of the pants of skirt. A wide horizontal neckline, high in front and back. 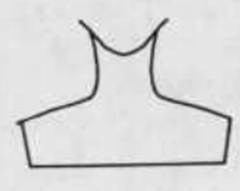 Often referred to as a bateau neckline. Reaches nearly to the shoulder line but sits close to the neck. Wider but not as deep than a scoop neckline (shop boat necklines). The boat neck can balance a fuller midsection by drawing the eyes to the shoulders. Works best for those with small to medium bust, pear shapes, and slender shoulders. 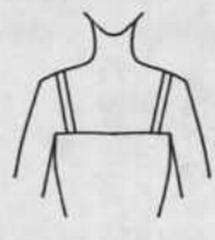 A camisole neckline falls just above the bustline and is held by straps over the shoulder. The strap width may vary from very narrow (spaghetti) to very wide. A jewel or V-neckline that opens in the front, usually with buttons along the center. A neckline that features one of dozens of different collar types. It’s a classic neckline that works for all body types but works best for those with small to medium busts, small to wide shoulders, and pear or curvy shapes. 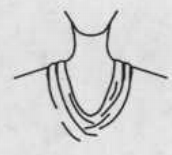 A cowl neckline is a draped neckline resulting from a bias cut with excess fabric forming soft folds in the front or back of the garment. A round neckline that sits close to the neck. Commonly seen in T-Shirts and usually has a band around it (shop crew necklines). 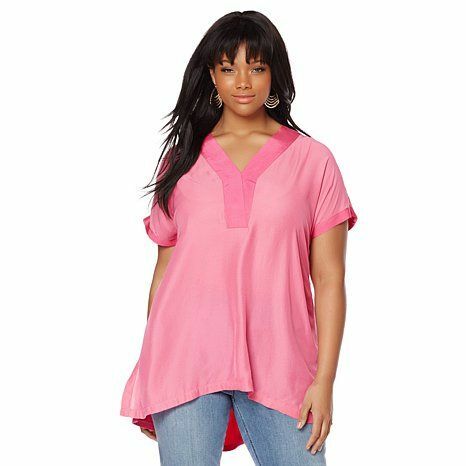 Crew necklines accentuate the face and shoulders and work best for those with small to medium busts, long necks, or wide shoulders. A crossover neckline features straps or cutouts that make a crossover-pattern in the front or rear of the neckline. 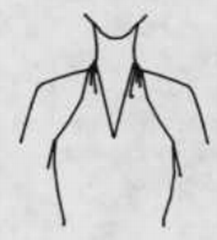 A decollete neckline is any neckline that is cut very low in front. It often refers to a wide, gently curving deep V neckline. Can also be called a plunging neckline but typically is not cut quite as far down as a plunging neckline. 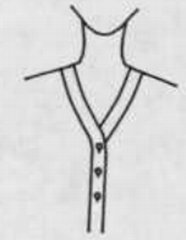 A moderately low neckline but very wide and angular. 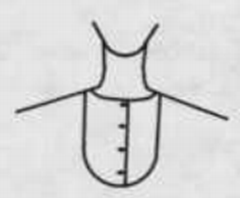 A high neckline cut in one with the garment by slanting or curving the shoulder seams upward towards the neck. They are often referred to as built-up necklines. A gathered neckline is a full neckline drawn close to the neck. It may be adjusted or gathered with a drawstring, cord, or elastic. 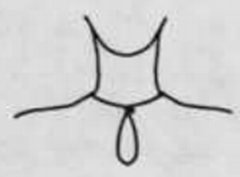 Often referred to as a drawstring, peasant, or gypsy neckline. A sleeveless neckline with the front of the garment held around the back of the neck by a band extending from the front. 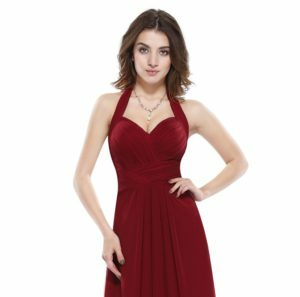 Halter necklines draw the eyes upward and work best for those with medium to full busts, wide shoulders, and straight or hourglass midsections. A low rounded curved neckline, shaped like a horseshoe in front. 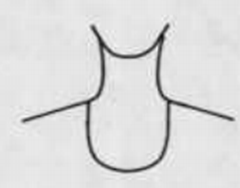 A high, round neckline located at the base of the neck, usually plain. it is circular and without a collar. It is usually wider and deeper than a Crew neck while still maintaining it’s circular shape. 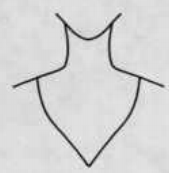 A very common neckline seen in dresses and tops named because the neckline follows where a necklace would lay (shop jewel necklines). 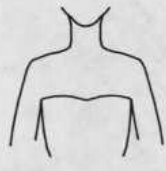 A high neckline with an opening cut out at the front. The opening can be round, oval, tear, or wedge shaped (shop keyhole necklines). Also called a Bardot neckline. An open shoulder neckline is a low neckline extending around the upper part of the arms, baring the shoulders (shop off-shoulder necklines). 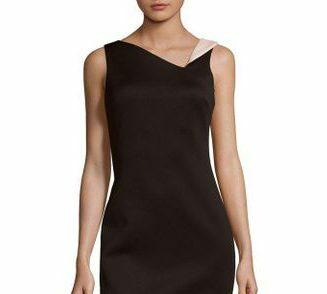 A bardot neckline draws the eye to the shoulders and works best for those with small to medium busts, slender or narrow shoulders, and virtually any shape (pear, athletic, petite, hourglass). This is an asymmetric neckline starting over one shoulder and extending diagonally to and under the other arm. 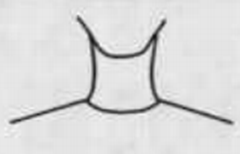 Sometimes referred to as a asymmetric neckline. 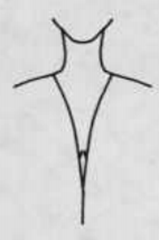 A plunging neckline is a low-cut neckline, usually V-shaped. It extends to the level of the breast or to the waist. 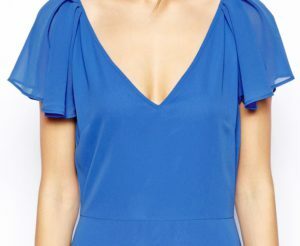 It is lower than a decollete neckline (shop plunging necklines). 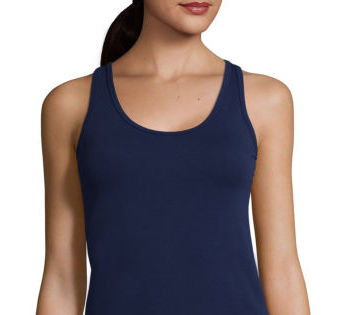 A racerback neckline features shoulder straps that are joined between the shoulder blades (shop racerback necklines). 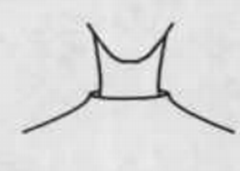 A wide horizontal neckline, a variation of the boat neckline but not as high as a boat neckline. They are sometimes fastened at the shoulders. 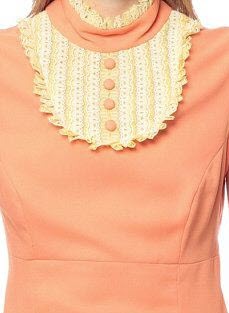 Scoop necklines are a deep U-neckline. They are medium low in front, rounded, and wider than the base of the neck (shop scoop and U-necklines). 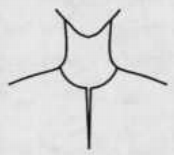 A Scoop neckline can elongate a short or thick neck. Work great for those with narrow shoulders (gives illusion of longer and wider look), hourglass shapes, and anyone who wants to create an illusion of a larger bust. Spaghetti strap necklines feature very thin shoulder straps used to support the top while providing minimal shoulder straps leaving the shoulders bare. They are also referred to as noodle straps. 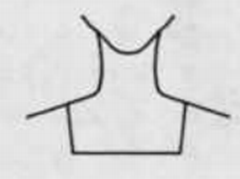 A moderately low-cut neckline that is square or angular in front. 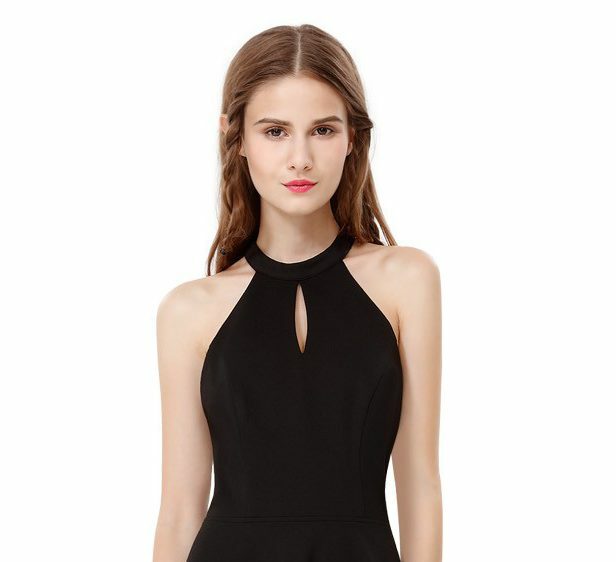 A square neckline creates a longer, leaner silhouette. They are great for women with large busts because they expose shoulders without revealing too much cleavage. They work great for those with round faces (balances out the roundness), pear shapes (makes the shoulders appear broader), or short necks (elongates the upper body). 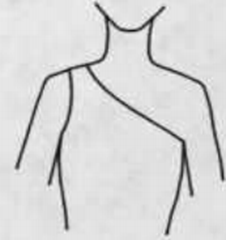 This neckline falls just above the bust. It may be held in place by darts and fitting, boning, elastic, or shirring. 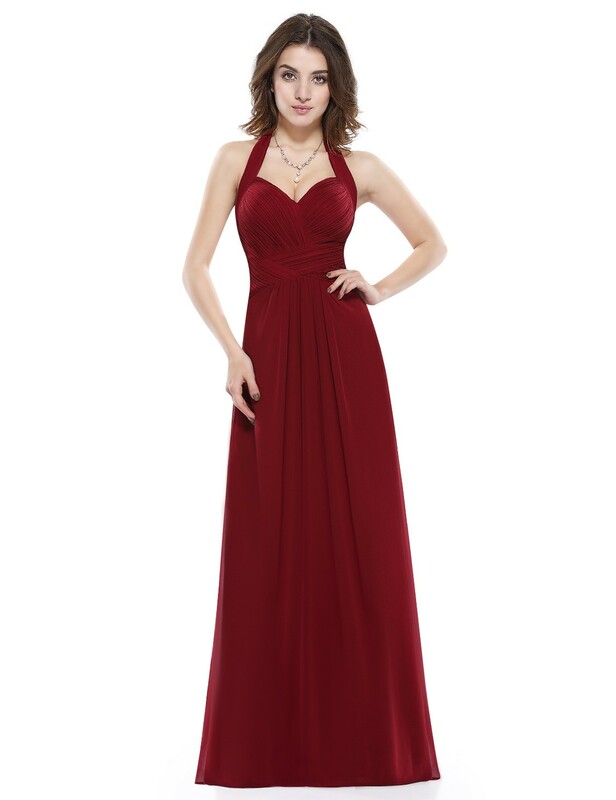 Since it shows skin around the neck and arms area, strapless necklines look most flattering on women who have wide shoulders and a small bustline. Works well for those with long necks, well-toned arms, and great shoulders. 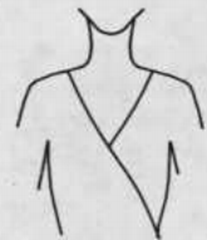 A surplice neckline is a neckline that wraps forming a V-neckline in the front or back. A sweetheart neckline is lowered in the front and shaped like the top of a heart. The sweetheart neckline works great for those with large breasts since it provides considerable coverage. 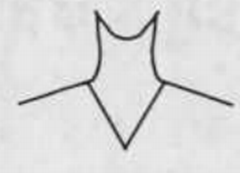 This neckline also elongates the face and provides balance to the overall silhouette. 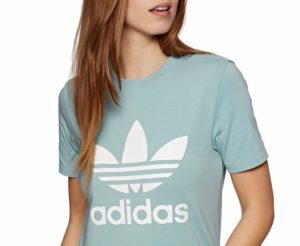 Works well for those with short chins or necks, angular faces, and petite women with small breasts and narrow shoulders (shows more curves). Tank top necklines are similar to spaghetti strap necklines but with larger straps. The large neckline is identical to a scoop neckline but is usually accompanied by large armholes that can reach down as far as the bottom of the chest. 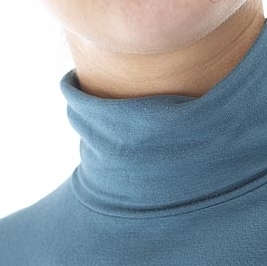 A turtleneck neckline, also called a polo neckline or roll-neck, is a close-fitting, round, and high collar that folds over and covers the neck. 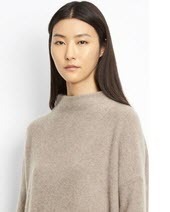 Turtlenecks whittle away height making them great for those looking to offset a long neck or face. 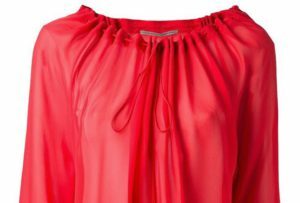 They also work great for those with small chests (benefits from the higher neckline) and narrow shoulders. 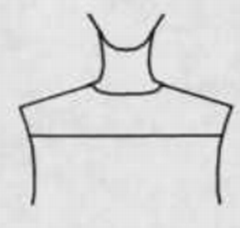 U-necklines are medium low in front, rounded, and the same width as the base of the neck. 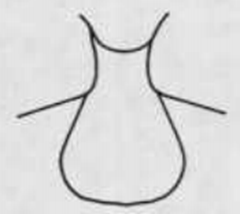 Similar to a scoop neckline but falls further and is more U-shaped. V-necklines are cut down in front or back to form a sharp v-shaped point (shop V-necklines). They give vertical impression to the outfit and can create a leaner, taller silhouette while drawing the eyes upward. V-necks are a great neckline for those with broad shoulders, thick mid-sections, or short necks. 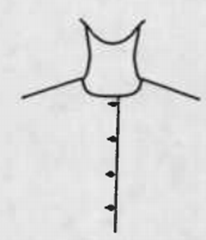 A yoke neckline is a separate portion of the garment in the shoulder and neckline area with a seamline attaching yoke to the lower portion. It may be straight, horizontal, angled, or curved. Previous post: Why are fabrics sometimes blended? The advantages and disadvantages of various common fabric blends.